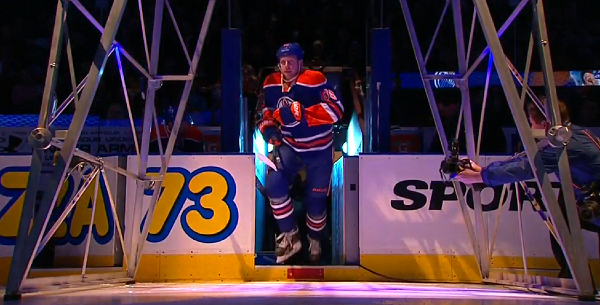 On Thursday, the Oilers recalled defenceman Nikita Nikitin from the Bakersfield Condors. Nikitin, who was demoted to the AHL out of training camp, returns to the roster as a replacement for another struggling veteran. Yesterday the Oilers placed Mark Fayne on waivers (he has since cleared) and so there was room to add another rearguard to the roster. This is an interesting move, and tells us a few things about the Oilers organization. The first thing this tells us is about Nikitin himself. It had to be embarrassing for the veteran NHL’er to be cut by the Oilers out of training camp, and having made such a decision Edmonton could well have left him in the minors for the entire year; it’s not like there weren’t other candidates for recall on the back end. That he’s back suggests rather strongly that the coaches down on the farm are pleased with the work that he’s done to get back to the majors. 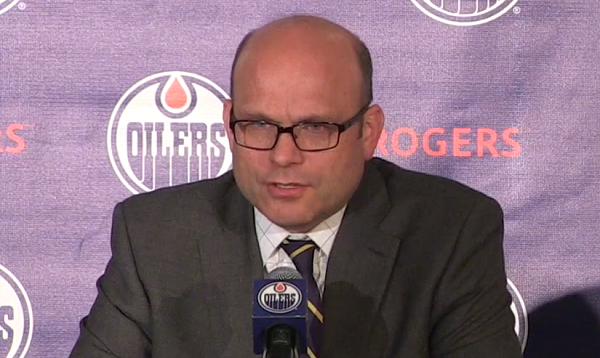 It also shows once again that the Oilers under Chiarelli are willing to revisit decisions. If this is good news for anyone, it’s Fayne, who in Nikitin should see his own path back to the NHL. Work hard and play well in the minors and a door opens up. What it says beyond that is more open to question. One way to read this is as asset management, or an indication that a trade is on the way. Nikitin is in the final year of his deal, can play both the right and left side of the ice, can contribute in multiple ways when he’s on his game and generally hasn’t been as bad a defenceman over his career as he looked in his first year with Edmonton. If he plays well, he might be worth a mid-round pick at the deadline to a team in need of help on the back end. The other way to read this is as a strictly merit-based decision, which is probably even more interesting. If this move was simply a result of the Oilers recalling the best defenceman in the system, that reflects negatively on people like Griffin Reinhart and David Musil, both of whom we would expect to be in the mix for NHL minutes. In Reinhart’s case, it may simply be a case of the Oilers not wanting to bounce him around like a yo-yo, though it gets harder to make the “he’s only down because of waivers” argument when Nikitin is recalled. In Musil’s case, waivers become a factor next year and if he’s going to make the NHL out of camp he’s probably going to need to do what Brandon Davidson did last year and get a cameo in which he looks at least somewhat ready. Either way, this isn’t good news for Andrew Ference, who seems likely to resume his duties as the team’s No. 8 defenceman when he comes off injured reserve. It may also be bad news for Eric Gryba, who barring injury seems the defenceman most likely to come out of the lineup to open up space for Nikitin. Whether or not this move was made as a way to showcase Nikitin, it’s hard not to feel good for the player. If someone is interested in him at the moment, he’s clearly played well enough to arouse that interest; if not he’s played well enough to earn another shot with the team that waived him. Either way, he’s shown something after a tough training camp and an embarrassing demotion and he’s found his way back to the best league on earth. Monday Mailbag – Does Evan Bouchard crack the opening night lineup? man i hope that the train wreck pylon that is Nikki Nikitin does not get in the lineup anytime soon! though if he does it will likely be in place of Gryba. What this move REALLY says Johnathon is that the oilers have zero depth on defense. The other two observations you make are purely secondary. Klowe/Mact were a compete disater at building this teams back end – horrible assessments/decisions made on what veteran defensemen to acquire. They have put the team into a hole so terrible that it may not be able to build up the defense in time to make a push with all of the frontline talent before mcdavids elc runs out and cap Armageddon hits the team. I know you should never feed a troll but Jebus H. Christmas your doom and gloom act is tired. Serious Gord circa April 2016: “aw can you believe the Oilers only have 2 out of 3 Calder Finalists this year and barely missed the playoffs? Blargh MacT Klowe Katz….”. 4 game win-streak. Without Conor. I’m sure you will find some fault with that some how, some way, but please keep it to yourself and let the rest of us enjoy something for the first time in a decade. The topic is the recall of nikitin and its reasons/need. Iow what it means. You want to disagree with my opinion go right ahead. Hopefully he is only here to keep Ferrence company until the trade deadline. Bring him up to showcase ? Schultz next to go on waivers ? Sadly, I think that’s a pipe dream but being included in a trade is more likely with Schultz and that’s fine with me. Lol. Ya. I’m sure teams are on the phone 24/7 in hopes of aquiring two of the oilers most maligned dmen. Hey here’s an idea! Throw ference in that package! Three dmen for webber????? How could Nashville resist that deal hey oilersnation? Lol. Wow. This is nothing more then an attempted pump and dump. They are praying he can play like a actual 3rd pair D.. to recoup some of the lost draft picks for Tmac And Chia. Musil is a write off. Not even close to an NHL D man. Bad draft Pick. As I said before, the most interesting aspect of the Hamonic trade request that no one mentions is the unique arrangement between the Islanders and Barclays arena deal and is a key factor why no deal has been done – the request happened in the summer. Essentially the Islanders have given away the hockey business operations over to Barclays in exchange for a guaranteed revenue stream, all ticket sales, parking concession revenue is owned by Barclays not the Islanders, only one in the NHL, meaning any additional salary taken on by the islanders cuts directly into the profit of Barclays corporation and because Hamonics contract is such a value contract, the only way you can make an offer is to trade a value contract back at or less than Hamonics which is very difficult to do if the Islanders want Dman back. What is interesting is offering of prospects or picks would appeal to Barclays bottom-line, Barclays would make more money Islanders would not be better off so they may not sign off, be very interesting how this unique arrangement will impact Islanders competitiveness in the future – hoping ON writes about this. Gave away all hockey operations? That seems pretty odd. You sure that’s accurate? As yes that statement was confirmed from Barclays and Nets CEO Brett Yormark in the Hockey News over the summer. I’d be surprised if any NHL team, even the Islanders, let their landlord tell them how to assemble their roster. Are you sure signing and trading hockey players is hockey business operation, not hockey operation? Cold spaghetti and egg rolls! Can’t be any worse than Fayne , or even Gryba for that matter. Nikitin being showcased for a Hamonic trade? Who cares who’s on the blueline?? when you have NILSSON IN NET!!! Why don’t we try Schulz at RW? We have a depth issue on that wing anyways, and with all of the injuries up front, and the “depth” of heathy dmen, it makes sense to try it. He may be virtually worthless as a D (dare i suggest a liability), but may have a little value as a RW. As well, he does have good hands, skates well, and has a solid wrist shot. Sounds pretty familiar to what we already have (Eberle and Purcell). I would really be interested to see him play up front. There is no way he could be worst than stone cold hands Korpikoski. Pull Schultz out of D, insert Nikitin for the time being. Pull Korpikloski out of RW and insert Schultz. You no nothing about defenceman. So just plug that hole of yours. And you clearly “know” nothing about spelling. Shine him up for the trade deadline…….. or sooner. If he is willing to shoot the puck………play him! The only “shooting defenceman” that we have is Davidson and Klefblom. Nurse will eventually round out his game and become a shooter, but we do not have enough shooters on this team. Our “Norris” defenceman is a passer so we effectively have very few options on the PP. This might be NN’s best chance to secure a job. MAn would it be nice if we could send JS down to the farm to teach him how to shoot a puck……..how did this guy ever make it to the show without a slapshot? I’m usually more concerned with the wiffs on passes and how slow and off target the other passes usually end up being from Schultz. Its like Foster all over again. Hall can’t take a slapshot and he is doing quite well in the NHL. Doesn’t matter. It’s schultz. He doesn’t play like pronger so he’s just garbage on here. Everybody just completely ignores it when he does take slapshots because I have seen him do it. I just honestly believe that because he doesn’t have a howitzer and neither does anyone else on the team, the pp is setup for the down low play. But that’s my opinion. Oilersnation will surely disagree with that. Brandon Davidson has a howitzer…. He’s got a good shot but is he a 1st unit power play guy yet? I don’t think so. Just my opinion. I love his game so far but he’s not ready for that yet. Yes Hall is doing very well……….but Hall does NOT play defence. Hall shoots the puck from inside the perimeter and most defenceman shoot the puck from the blue line. Let me help you understand. It’s critical to the position……..it would be like hiring a pilot who did not know what a plane looked like?? I don’t know, Smitty played LW and as Oiler Nation knows he was renowned for his clapper. JS has a sneaky little wrister instead. It just doesn’t work in the NHL. I wonder how often he dreams about his glory days on the Barons when that thing went in all the time. Accompanied by Howson and Klowe, just like in the hyundai commercial. Maybe he learns from his demotion and contributes positively to the team. A bonus would be him playing well enough to become a tradeable asset at the deadline. Better than nothing…found money, unless you count his insane contract. Der McT….sigh. Would it be in Ference’s best interest to waive his no move clause and take a demotion to the Condors? He’d get some playing time and a good chance to polish up the weaker aspects of his game. Maybe open up trade opportunity? On top of that the escrow wouldn’t apply while he’s there – if I recall correctly? Win – win for both the Oilers and Ference in my opinion. I wish you were right, but don’t see Ference’s problem being anything more than size combined with age catching up to him. I doubt there are many Oilers who train as hard as Ference to try to stay competitive.